While the man who filmed Eric Garner being choked to death by the NYPD, the cops responsible for his death are still getting paid. Four years have now elapsed since New York City Police Officer Daniel Pantaleo choked Eric Garner to death for the apparently egregious crime of selling loose cigarettes — but the only one related to the case who faced any punishment so far for what many believe to be a cold-blooded murder is the man who filmed it. 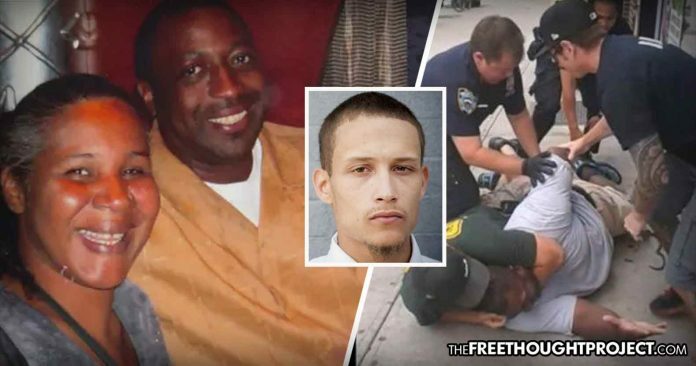 While Orta rots in prison, the officers responsible for the death of Garner remain free. Finally, however, this all may be about to change. On Monday, the New York Police Department announced that they’ve become impatient with the Justice Department’s slow pace at its investigation into the death of the father of six. The NYPD announced that it would soon start disciplinary proceedings against the officers involved in the killing of Eric Garner as federal action is absent. As the NY Times reports, the Police Department, acting one day before the fourth anniversary of Mr. Garner’s death on Staten Island, said it would no longer hold off on disciplinary proceedings if the Justice Department had not announced by Aug. 31 whether it will file criminal charges. “Understandably, members of the public in general and the Garner family in particular have grown impatient with the fact that N.Y.P.D. has not proceeded with our disciplinary proceedings and they have difficulty comprehending a decision to defer to a federal criminal investigation that seems to have no end in sight,” Lawrence Byrne, the department’s deputy commissioner for legal matters, said in a letter to the Justice Department on Monday. According to the Times, the disciplinary proceedings would involve Officer Daniel Pantaleo, who was seen on a bystander’s video holding Mr. Garner’s neck as he begged for breath, as well as a sergeant, Kizzy Adonis, who was one of the first supervisors at the scene. Sergeant Adonis has already been administratively charged with failing to properly oversee her officers, according to a senior police official, who spoke on condition of anonymity to discuss a personnel matter. The disciplinary proceedings against her, however, have paused, pending the federal investigation. While this may seem like a step in the right direction, to those who’ve been following the Garner case, there is little hope for any actual justice. Defying all reason, Pantaleo remains on the force — having faced no penalty for killing a nonviolent man who committed a crime under only the strictest legal definition of the term. And Orta, who filmed the gang of police protecting Pantaleo’s actions, preventing anyone from stepping in to allow Garner to breathe, is sitting in jail on ostensibly unrelated charges. Before he was sentenced, Orta claimed he’d been constantly harassed by the cops and repeatedly arrested since that day — almost certainly retaliation for exposing the brutal incident to the world. This lack of charges and discipline is in spite of the fact that Garner’s family received a $5.9 million settlement with New York City, courtesy of the taxpayers in 2015 — marking another aspect of how police brutalize citizens with virtual impunity as they aren’t required to carry liability insurance even for the gravest of wrongdoings. Erica Garner, the victim’s daughter, who became a tireless advocate against violent policing, sadly passed away late last year knowing that there had still been no justice for her father. Appallingly — four years after Pantaleo slipped his arm around Eric Garner, pulled him to the ground, and strangled the last breath from his body — countless other murders of black men and others by police have distanced much of the public-at-large from the horror. As Claire Bernish wrote two years ago, after there had still been zero justice for Garner, horrific police brutality and violence — and their impunity in committing obvious crimes — have stifled this nation in every conceivable way. Sadly, four years later, we — as a nation, tragically echoing Eric Garner — can’t breathe.